Make the right impression and personalise your own Corporate Shirts from our large selection of Personalised Clothing with logo embroidering. The Personalised Company Clothing we supply is of the finest quality, all customised and embroided with your business details and company logo. Excellent for office and floor staff, why not make a dazzling impression with that extra finished touch of perfection. 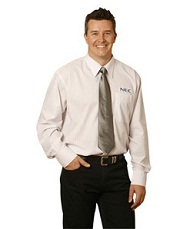 Since your point of sale often involves direct contact with a member of staff in your corporation, make the right impression with Promotional Clothing and you can't go wrong. We also have Have High visibility clothing that's suitable for all safety outdoor working environments. Great for any college campus, and primary or secondary high schools, our updated range of School uniforms with embroidered crest offer's a suitable and prestigious uniform to present your school in a good light. Orders can be made in large quantities for our School embroidered clothing. For more information on our embroidered clothing range, please fill in the contact form and we'll get straight back to you! Corporations go to great lengths to ensure they build a friendly and reassuring workforce to the general public with quality Personalised Clothing. Retail industries, banks and restaurants like to deliver a special service for the increasing expecations of the customer, and with Personalised T-shirts, Shirts with embroidered logo and more available here - you can deliver quality clothing as a 'perk' that your employees can honour, and work to their best performance possible. Office uniform and Uniforms with logo help to remind your staff that they are a whole, a part of the team and with this great honour to live up to - they can establish trust and mutual cooperation within your Company. Both morale and a sense of belonging can be easily achieved with some personalised clothing - customised with your corporate crest, logo and branding for a unique and fitting uniform for the office, shop floor and more.